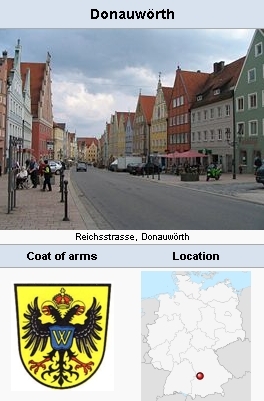 Donauwörth is a town in Swabia, Bavaria, Germany (coordinates: 48° 43′ 10″ N, 10° 47′ 0″ E). At the time of the Reformation it was a free imperial city, to which the Reformation found early entry, so that the Protestant population soon predominated, and in which Anabaptists also found adherents. In 1527 Hans Denck is said to have lived here for a while after he had completed his translation of the Prophets; information is scanty. The bloody persecutions setting in on every hand made further growth very difficult. The only extant information on the presence of Anabaptists in Donauwörth is found in the official records of the persecutions. Most of them fled to Moravia, where they were for a time unmolested. But when persecution broke out there in 1535, many hoped to find refuge in the home town. Their return was made extremely difficult, for the dukes Wilhelm and Ludwig had the border strictly guarded to prevent the entry of any Moravian Anabaptists. On 19 May 1535 a group of seven men, five women, and three children trying to return were arrested at Passau and put into the castle dungeon. Of these, Georg Lang, from a farm at Atzersweilen on the Swabian-Franconian border, had been baptized at Donauwörth by Adam Stock; and Adam Schlegel had baptized Hans Hultzhoder of Kupferzell, Amalie, the wife of Hans of Atzersweilen, Kunigunde, the wife of Dittrich of Heilbronn, and Katharina, the wife of Hans Haffner of Riblingen. On 24 September 1535 the leader Hans Betz of Eger was seized, who had been baptized in 1530 above Donauwörth by Georg Haffner. According to the statements of court officials, the prisoners openly admitted belonging to the Anabaptist brotherhood (Wolkan, Lieder 29 and 21), and in spite of torture remained steadfast, comforting their persecuted brethren in a series of hymns which they and their fellow prisoners in Passau composed, thus laying the foundation for the Ausbund, which was used for centuries by the Mennonites of South Germany and America and is still used by the Old Order Amish. Hans Betz, who wrote 12 hymns, died in prison in 1537; most of the others died after three years in the dungeon. Hege, Christian and Christian Neff. Mennonitisches Lexikon, 4 vols. Frankfurt & Weierhof: Hege; Karlsruhe: Schneider, 1913-1967: v. I, 461. Winter, Vitus Anton. Geschichte der bayerischen Wiedertäufer. Munich, 1809: 35. Hege, Christian. "Donauwörth (Schwaben, Freistaat Bayern, Germany)." Global Anabaptist Mennonite Encyclopedia Online. 1956. Web. 23 Apr 2019. http://gameo.org/index.php?title=Donauw%C3%B6rth_(Schwaben,_Freistaat_Bayern,_Germany)&oldid=119219. Hege, Christian. (1956). Donauwörth (Schwaben, Freistaat Bayern, Germany). Global Anabaptist Mennonite Encyclopedia Online. Retrieved 23 April 2019, from http://gameo.org/index.php?title=Donauw%C3%B6rth_(Schwaben,_Freistaat_Bayern,_Germany)&oldid=119219. Adapted by permission of Herald Press, Harrisonburg, Virginia, from Mennonite Encyclopedia, Vol. 2, p. 83. All rights reserved. This page was last modified on 12 April 2014, at 05:49.